$50 says I can tell you the Frederick company that blew you off. Also true about getting a safe from the web. I did and thankfully my neighbor had a Bobcat. Curbside means exactly that. "Not that the heart can be good without knowledge, for without knowledge the heart is empty. But there are two kinds of knowledge: the first is alone in its bare speculation of things, and the second is accompanied by the grace of faith and love, which causes a man to do the will of God from the heart." I agree, my friend ordered a huge Cannon from on line and they dropped it off at the base of his 60yd driveway....LoL....luckily, even though the size of the safe was three times mine, it still only weighed 900lbs. My smaller ones weigh 950lbs each. 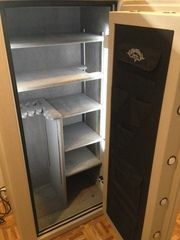 I would never mess with a online delivery for a safe because even if they do provide deliver and setup, I think they were charging $500 or so....Safe and Signs didn't even come close to that price in delivery. Sorry bud...if you really want the larger image, I'll have to retake the photo and repost. It'll be less then other nearby dealers..and worthwhile to buy from these guys. I purchased two so my cost was less. Also, they only charged me for delivery for one safe...which was very generous of them. 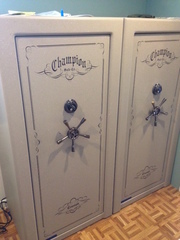 Other dealer quoted me full delivery for one safe and 1/4 for the second safe....which was near triple the cost just for delivery compared to Safe and Signs, to give you an idea. But you really need to speak with them because prices of safes have gone up from last year when I put the order in. I even tracked prices from online stores such as WestCoast safes, etc...and prices did go up for the 2016 models. BTW, if you put in for a safe they don't have in stock, it's a two-three month lead time depending on what model you get. TR-30 supposedly has faster turn around because it's one of their best selling size.